On March 11th, in recognition of Women's History Month, Columbia University's Institute for Research in African-American Studies is hosting Women Picturing Revolution: Focus on Africa and the African Diaspora, a one-day seminar co-created and taught by Lesly Deschler Canossi and Zoraida Lopez-Diago that re-examines history with a radical lens. Focus on Africa and the African Diaspora... is part of an ongoing series, Women Picturing Revolution founded by Deschler Canossi and Lopez-Diago in late 2016, with a goal of addressing the various ways women have approached conflict through photography. We spoke with the two founders about the upcoming seminar, and their plans for the future. Jon Feinstein: How did this collaboration start? WPR: We hold a shared interest in issues facing women and girls worldwide. Since early 2015, we have been exchanging information, articles, and pictures. We began to ask who are the women documenting conflict in private realms and public spaces. We gathered hundreds of examples of work being made by both well known and lesser known photographers. We were particularly interested in work that uses social media to bear witness or connected people displaced by violence. We asked what are the long term effects of trauma? We were also very interested in access. Do female photographers have the same access to their subject as their male counterpart? If not, how could that moment be used to make the work that had to be done? We're more and more stories that examine the condition by which women live in the world emerging as a result of the intimate access a female photographer may have over a male colleague? These are some of the questions that we were asking and that lead to the ultimate creation of Women Picturing Revolution (WPR). Jon Feinstein: Since the election results, it's been exciting to see so many artist organizations getting more active in using art for social change -- from print-sale fundraisers to agencies with a focus on social good. What makes WPR stand out? WPR: We are specifically interested in not only the image, but also the ways in which women use storytelling through images to counter the dominant narrative. By elevating this counter narrative, we believe that photographs can change public opinion, policy, and ultimately, the course of history. This type of shift occurs by speaking explicitly about the image and linking it to the social and political implications it holds. Upon reflection of the election results and in response to a question posed on the means by which a woman’s body can be controlled, Gloria Steinem explains that“when we look at the predictors of whether a country will be violent within itself or whether it will be willing to use military violence in another country the strongest predictor is not poverty or access to natural resources, or religion or even degree of democracy it is violence against females because that’s what we see first in the home or at least (the) control or dominance of females. It normalizes the idea that one group is born to dictate to another” (source: NPR/WNYC The Takeaway, November 9, 2016). WPR is interested in propelling work forward that was traditionally seen to be focused on “women’s issues” but is now being appropriately understood as issues that affect every layer of society. Jon Feinstein: What's behind your tag line "Reclaiming and retelling history in a manner that is both radical and necessary"
WPR: We are living in a time where issues concerning women and girls are beginning to receive the attention they deserve, but there’s still a lot of work to be done. In the U.S., we’ve seen how three African-American women started Black Lives Matter, an international and growing movement that campaigns against violence toward black people. Sheila Pree Bright, who documents modern day social movement protests, gives voice to not only the protester, but also people, particularly women, whose activism for social justice, at times, goes unnoticed. And through this, we see how her images call for a more holistic and radical approach to recording history, one that advocates for the right of all citizens, in both public and private realms, to fully participate in the process. This approach, which places equal value on images made in the streets and documenting acts of revolution in one’s home or neighborhood is a core mission of WPR. By bringing images made in forgotten spaces by often overlooked people to the forefront, WPR is "reclaiming and retelling history in a manner that is both radical and necessary. " Jon Feinstein: How did you go about selecting the artists for the upcoming seminar at Columbia University and why focus on Africa and the African Diaspora? WPR: When we were putting the work together for WPR at the International Center of Photography (ICP) we found that it was challenging to find female photojournalists working in Africa, and even fewer from Africa or the African diaspora. We wanted to shine a light on the incredible work that is being made not only by photojournalists and documentary storytellers but also from artists working in lens based mediums. We know we are not alone in the mission and by bringing their powerful message forward we hope to contribute to the visibility of these artists. We selected these individuals by looking at artists we know who make strong work that we’ve been following for quite some time. We also conducted research for this class by asking photo colleagues for their suggestions, combing through visual based posts on Instagram and Facebook, and scouring through international periodicals that use photographs to tell stories. Jon Feinstein: What can participants expect to glean from the seminar? WPR: In-class content includes analysis of photographic work and projects, partial film screenings, review of related literature, conversations with guest artists, and a look at how contemporary image makers are using social media. As curators and photo educators we lead the conversation and create a collaborative environment that encourages WPR participants to contribute to the discussion; the role of the visiting artist(s) is a crucial element to this collaboration because it allows our participants to directly access artists from across the globe andlearn about a particular body of work and/or project in an intimate setting. We share work relevant to a topic and frame it into a larger discussion that aims to better understand how women document resilience, resistance, and creative survival. We want the participants to leave informed, inspired and activated. JF: I'm sure there are many, but who are some of your favorite Women Picturing Revolution right now? WPR: When we started WPR, we reached for some of our favorite image makers and had the pleasure to work with them. For the WPR panel in Fall of 2016 at ICP Donna De Cesare, Tanya Habjouqa and Muriel Hasbun were incredibly generous with their time and participation. We were also fortunate to have Sheila Pree Bright join us via Skype as she prepared for an exhibition at Project Row Houses in Houston, TX and Laura Doggett of Another Kind of Girl Collective join us from Jordan via Skype during a recent WPR seminar. Laura was joined by Khaldiya, and, a seventeen-year-old Syrian girl living at the Za'atari Refugee Camp. In 2015, Khaldiya made a short documentary about her life and the life of her family and although the film has been shown at Sundance, SXSW, Cannes Film Festival, and the Los Angeles Film Festival, our artist talk was the first time Khaldiya was able to see a Western audience who viewed her work and have a dialogue with them that included answering their questions and presenting questions of her work. This was an incredible and rewarding moment and we crave these kinds of conversations at WPR. Khaldiya is definitely a woman picturing revolution and someone who embodies what WPR seeks to promote - she is an individual who questions what is and pushes beyond what is expected. JF: You're both active photographers as well. How does your own work and practice fit into the work you're doing with WPR? WPR: As artists who also happen to be mothers we often have conversations about what it means to be a mother and artist. Egyptian artist Heba Khalifa writes about being confined as a mother with a revolution going on outside her door. She writes, “The domestic space becomes the site of the uprising, of resistance, and a new found freedom.” Her self-portraits with her child are raw and confrontational and with her words and pictures, she was able to get to the core of the often hushed experiences of motherhood. 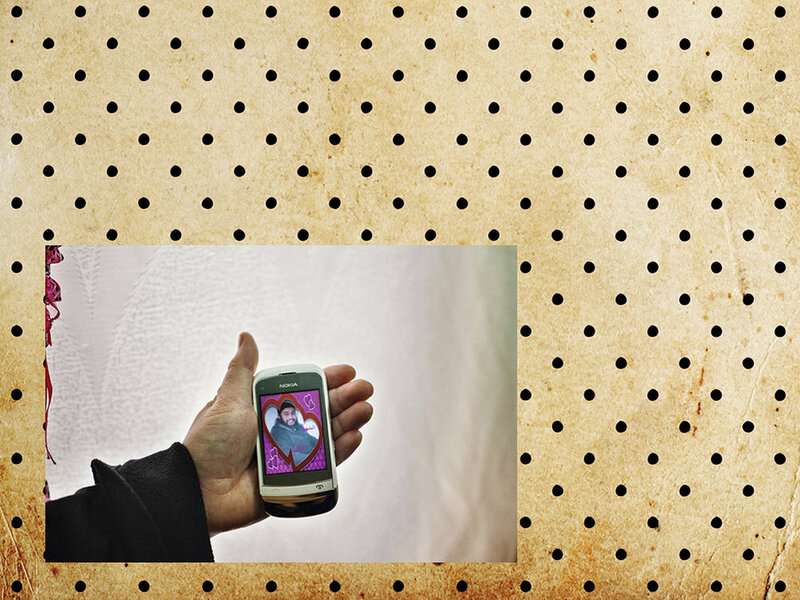 In Heba’s work and in our personal lives, we see how new ways of working emerge. We see WPR as an extension of our making. We continue to work on our personal photographic projects but the pace may be a bit slower while we nurture WPR. Lesly’s work Domestic Negotiations (2012-ongoing) is a look at the push and pull of motherhood, partnership, the domestic landscape and the role as mother as artist. Zoraida is currently documenting where children of undocumented farmers in upstate New York sleep, with a particular emphasis on documenting how they continue to hope and dream while navigating our current political and social climate. JF: What's coming up in the pipeline after March 11? WPR: We are continuing to lead seminars and have From the Margins: Women, Conflict, and Revolution—Film Series at ICP beginning April 12th. This is a five-week seminar that surveys full-length feature films, short films, and interviews and conversations with guest artists. We are interested in how these documents hold the potential to drive social change and public policy. Moving forward, we are in conversation with a couple of museums who are interested in WPR. That is incredibly exciting for us. We are also committed to programming with institutions outside of the traditional arts/academia for a wider reach and potential for even greater impact. JF: Any dream collaborators for future panels? WPR: Yes. Many. We will need to keep WPR going for a lifetime to work with all the photographers, filmmakers, activists, educators and policymakers we have our eyes on. The good new is that there are more people who believe in progress than those combatting truth and justice. By highlighting that work and bringing it to a wider audience we believe this could be the way through this especially challenging moment. This belief is the bright light that keeps us up late at night working on WPR long after the kids are in bed. Lesly lives in Beacon, New York where she works as a photographer, printer and recurrent educator. She is faculty at International Center of Photography (ICP), owner of Fiber Ink Studio, a pigment print and drum scan lab and co-creator of Women Picturing Revolution. She holds an MFA from Maryland Institute College of Art (MICA) has taught at the Lamar Dodd School of Art in Cortona, Italy, the Maryland Institute College of Art and the Harlem School of the Arts. In 2014 her book Domestic Negotiations was published by with ICP edu. Lesly continues to work on this series and believes this to be a lifelong pursuit as the role of mother, wife, and artist is not a fixed position. Zoraida is a photographer, consultant, and curator. In 2011, Zoraida lived in and documented women serving sentences at Pedregal, a maximum security prison in Medellin, Colombia; she returned in 2013 to continue her work and focused on demonstrating the ways photography can be used to help improve community opinion of the incarcerated. In 2014, she co-curated Women as Witness, an exhibition revealing how women across the globe document survival and in 2015, Zoraida was the assistant curator of Picturing Black Girlhood, a photography exhibition highlighting important contributions of Black girls in the US. Since 2014, Zoraida has served as a consultant at Columbia University's Institute for Research in African-American Studies (IRAAS) where she has curated and organized several art based programs, events and panels. In 2016, Zoraida co created Women Picturing Revolution. With the support of a grant from Arts Mid-Hudson, Zoraida is currently documenting where children of undocumented farmers in upstate New York sleep, with a particular emphasis on documenting how they continue to hope and dream while navigating our current political and social climate.